George H. O'Brien, Jr. Image available on the Internet and included in accordance with Title 17 U.S.C. Section 107. O’BRIEN, GEORGE HERMAN, JR. (1926–2005). George Herman O’Brien, Jr., Korean War Medal of Honor recipient, was born on September 10, 1926, in Fort Worth, Texas. He was the son of George H. O’Brien, Sr., and Della (Cartwright) O’Brien. O’Brien’s father operated a grocery store, and his mother was a minister. Young George grew up in Big Spring, Texas, where he graduated from high school in 1944. O’Brien served as a seaman on a gasoline tanker in the United States Merchant Marine from December 1944 to May 1946. In 1946 O’Brien entered Texas Technological College (now Texas Tech University) from which he graduated in 1950 with a degree in geology. O’Brien enlisted as a private in the United States Marine Corp Reserve in July 1949. On November 27, 1951, he was ordered to active duty at Quantico, Virginia, to attend the Officer Candidate Course. After successfully completing the course in February 1952, he attended the Officer Basic Course from which he graduated in August. After additional training at Camp Pendleton, California, Second Lieutenant O’Brien was assigned to Korea and the First Marine Division in September 1952. On October 26, 1952, Chinese forces, backed by artillery, threatened to overrun a marine position known as the Hook, located on an important hill position (fishhook-shaped) near the thirty-eighth parallel. As the commander of a rifle platoon of Company H, Third Battalion, Seventh Marines, First Marine Division (Reinforced), Lieutenant O’Brien received orders to retake the hill on October 27. In spite of the fact that O’Brien’s company numbered about 100 men against several hundred Chinese Communists, the marines counterattacked after a fierce mortar and artillery bombardment. After giving the order to move forward, O’Brien, followed by his company, raced up the hill in the face of hostile fire. Although shot in the arm and knocked to the ground, he proceeded to lead the attack. After aiding a wounded marine, O’Brien threw hand grenades into enemy bunkers and then killed at least three enemy Chinese with the aid of his carbine in hand-to-hand combat. For an additional four hours, Lieutenant O’Brien continued to provide leadership and encouragement against a tough enemy. Although knocked to the ground on three occasions by enemy grenades and refusing medical treatment for his own shrapnel wounds, O’Brien established a defense for the rest of his men and attended to the wounded. After his company was relieved by another marine unit, O’Brien remained in the area to supervise the withdrawal of his men and prevent any wounded from being left behind. Lieutenant O’Brien was treated on the hospital ship USS Hope for his wounds. Ironically, he returned to combat a few weeks later and earned a second Purple Heart for additional wounds. While on a troop ship headed home in late summer 1953, O’Brien learned that he would receive the Congressional Medal of Honor for his actions of October 27, 1952. President Dwight Eisenhower presented the medal to Lieutenant O’Brien at a ceremony at the White House on October 27, 1953, one year after his heroics in Korea. 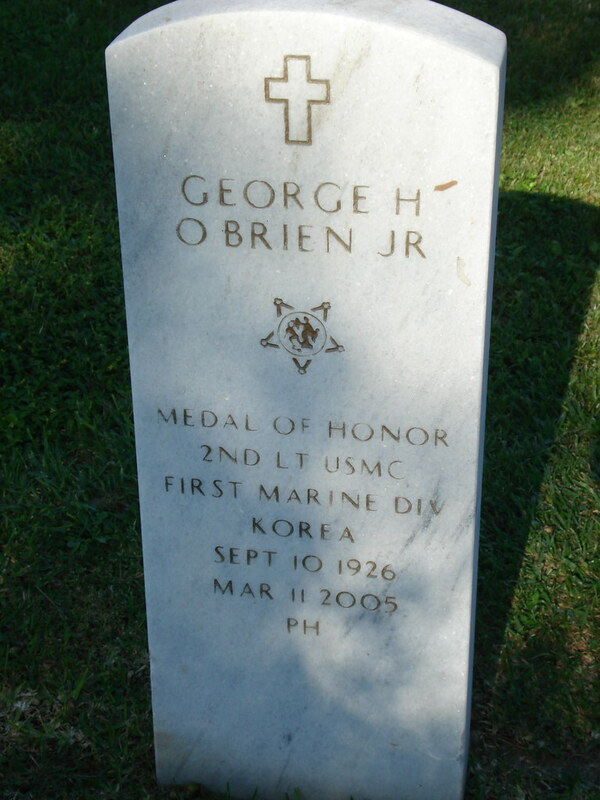 Grave of George H. O'Brien, Jr. Image available on the Internet and included in accordance with Title 17 U.S.C. Section 107. After the war, George O’Brien returned to Texas where he worked as a petroleum geologist and operated oil and gas wells in the Permian Basin in southeastern New Mexico and West Texas. He retired as a major in the Marine Corps Reserve in 1963. O’Brien’s first marriage to Janet Robb O’Brien ended in divorce; they had two sons and a daughter. On July 28, 1979, he married Sandra Rogers Holland. O’Brien lived in Midland, Texas, where his friends and coworkers saw him as a humble and gracious man. In recalling his Korean service, he told a reporter in 1991, “I didn’t do this by myself…there were a lot of my men who didn’t enjoy the older age that I enjoy.” George H. O’ Brien, Jr., died from complications of emphysema in Midland on March 11, 2005. He was buried in the Texas State Cemetery in Austin. In January 2012 the Big Spring VA Medical Center was renamed the George H. O’Brien VA Medical Center in ceremonies in which Senator John Cornyn praised the humble Lone Star hero. Big Spring Herald, January 19, 2012. Peter Collier, Medal of Honor: Portraits of Valor Beyond the Call of Duty (New York: Workman Publishing Company, Inc. 2006). “Major George Herman O’Brien, Jr., USMCR (Deceased),” Who’s Who in Marine Corps History, United States Marine Corps History Division (https://www.mcu.usmc.mil/historydivision/Pages/Who's%20Who/M-O/obrien_gh.aspx), accessed November 14, 2013. Midland Reporter-Telegram, March 13, 2005. New York Times, March 21, 2005. Washington Post, March 18, 2005. Handbook of Texas Online, Henry Franklin Tribe, "O’BRIEN, GEORGE HERMAN, JR. ," accessed April 22, 2019, http://www.tshaonline.org/handbook/online/articles/fobcm. Uploaded on November 20, 2013. Modified on August 24, 2017. Published by the Texas State Historical Association.